“Setting clear learning objectives” is a requirement you have probably read a thousand times when reading about how to design effective eLearning courses. However, “clear” may have different meaning for different people; what is absolutely clear to you may not be as clear as you think to your audience. In this article, I’ll show you specific ways to ensure that your learning objectives are crystal clear for everyone, and I'll also explain why this is so important for the success of your eLearning deliverable. Furthermore, I’ll share all the critical information you need to know about developing high quality learning objectives for eLearning. You have probably already read a lot about how important it is to have clear learning objectives before you begin developing your eLearning course; learning objectives are basically the essence of your online course’s goal, as they describe what you want your learners to achieve after completing it. Therefore, you do understand that when the learning objectives for eLearning are unclear or generic, so is the purpose of your online course, which is not only as ineffective as it sounds, but also very frustrating for your audience. Having clear learning objectives for eLearning is also a great tool for building the structure of your eLearning content; knowing exactly what you want your learners to achieve helps you organize your eLearning material in a proper way so learning becomes as effortless as possible and thus more immersive. All in all, there is no doubt that building clear learning objectives for eLearning is more than essential. But to develop them in the right way you need to know a few important things. In this article, I´ll delve into this critical topic and try to share all the information you need to know about how to write effective learning objectives for eLearning so that you will be able to develop and use them to your advantage. Learning objectives and learning goals are not the same thing. Learning objectives may be “the essence of your online course’s goal” as mentioned earlier, but they are not the same with learning goals. 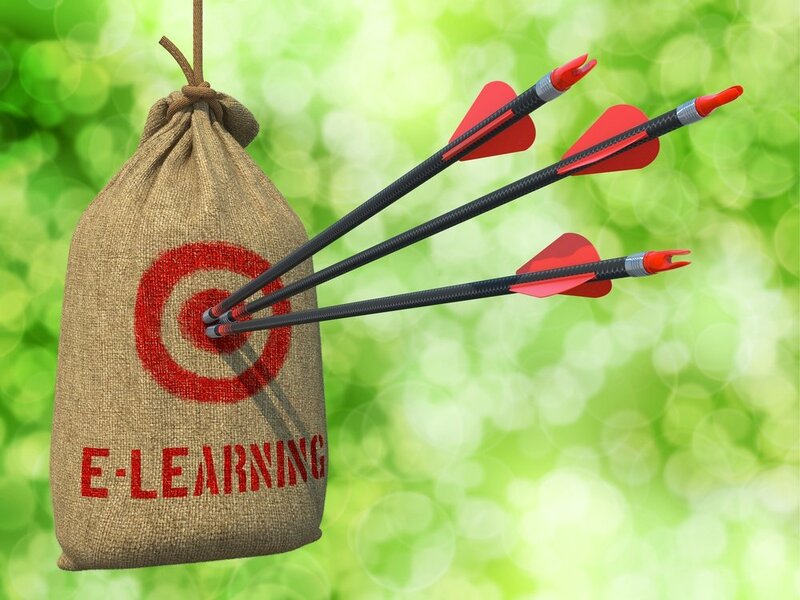 A learning goal describes in broad terms what the learners will be able to do upon completion of the eLearning course, whereas a learning objective describes, in specific and measurable terms, specific elements that learners will have mastered upon completion of the online course. The key words here are “specific” and “measurable”: Goals are broad; they help you focus on the big picture, though your learning objectives should be much more specific. Goals give you directions to write your learning objectives, but you should never confuse these two. There is some information which should not be included in your learning objectives. Your learning objectives should not include information about a) your audience and b) the strategy you are following to develop them. Both these elements are important, but they have no place in learning objectives. The only thing you need to have in mind when developing them is what your learners will gain by engaging in the eLearning activity. Learners must be able to recall or remember the information. Learners must be able to understand the information. Learners must be able to use the information they have learned at the same or different contexts. Learners must be able to analyze the information, by identifying its different components. Learners must be able to create something new using different chunks of the information they have already mastered. Learners must be able to present opinions, justify decisions, and make judgments about the information presented, based on previously acquired knowledge. Why Bloom’s taxonomy is important for developing your learning objectives? Because it helps you understand the level of cognitive processes involved in human learning, that is the natural order according to which your target audience will process the information you present. For example, the learning objectives for a compliance training course would be about making sure that the employees know the company’s policies and principles (Level 1: Knowledge), whereas the learning objectives of a productivity training course must be about making sure that the employees are able to put what they are learning to use in order to boost their performance (Level 3: Application). Bloom presented his taxonomy in a hierarchical order; however, often eLearning professionals dismiss lower levels as unworthy, which is a mistake. Lower-level objectives should never be ignored; on the contrary, before achieving higher-order learning objectives, eLearning professionals should first make sure that learners have all the necessary requirements in terms of previous knowledge in order to proceed. A pre-test, for instance, may be used to identify potential knowledge gaps and recommend learners a quick revision before taking the module under consideration. Memorize, show, pick, spell, list, quote, recall, repeat, catalogue, cite, state, relate, record, name. Explain, restate, alter, outline, discuss, expand, identify, locate, report, express, recognize, discuss, qualify, covert, review, infer. Translate, interpret, explain, practice, illustrate, operate, demonstrate, dramatize, sketch, put into action, complete, model, utilize, experiment, schedule, use. Distinguish, differentiate, separate, take apart, appraise, calculate, criticize, compare, contrast, examine, test, relate, search, classify, experiment. Decide, appraise, revise, score, recommend, select, measure, argue, value, estimate, choose, discuss, rate, assess, think. Compose, plan, propose, produce, predict, design, assemble, prepare, formulate, organize, manage, construct, generate, imagine, set-up. Align eLearning assessment with your learning objectives. eLearning assessment is used to evaluate what your audience is learning; the more consistent they are with your learning objectives, the surer you can be that your learners are onboard with your eLearning course. Remember to use specific and measurable verbs when writing them. Consider using the aforementioned list of verbs and their synonyms. Make sure that your learning objectives are appropriate for your learners. Whom are you writing your learning objectives for? Managers? Customer service? New hires? The sales department? What do they already know and what is absolutely necessary for them to learn? Consider analyzing your audience before you begin developing your learning objectives. Ask yourself if your learning objectives are achievable and realistic. In other words, ask yourself if they are achievable within the time-span of the eLearning course, and if they are supported with the appropriate tools and resources. Use simple language and keep them short. Simple language is direct and engaging, whereas limiting your learning objectives in one sentence will help your learners focus better on what is expected of them. If several, organize them in subcategories. Dividing your learning objectives into subcategories, if needed, will help you avoid overwhelming your learners. Now that you know how to create good learning objectives for eLearning, you may be interested in focusing on their alter ego: learning goals. Read the article Why and How to Develop Learning Goals Into your eLearning Course and find out how to use the learning goals to provide meaningful, interactive, and informative eLearning experiences for your learners. The best collection of eLearning articles, eLearning concepts, eLearning software, and eLearning resources.